Introducing the new 29’ Corsair 880 / Developed for the modern sailor; adventurous and versatile! Going back to where it all started – the Corsair F27, the sailboat hall of famer that once changed the sailing paradigm and revolutionized the sport worldwide. With its lightweight design and folding amas, this model allowed sailors to trailer a boat with reasonable living space across nations and even continents. The new 880 takes this concept to a whole new level! With tens of thousands of hours spent on this design the 880 has been developed for the modern sailor; adventurous and versatile. With full standing headroom, enclosed heads and the ability to sleep five she is destined to be come the next “peoples boat”. 180 Marine is the first dealer in the U.S. to receive the Corsair 880. The mission of the Corsair 880 is to provide sailors of all skill levels the opportunity to sail an effortlessly fast performance sailboat while being completely safe and comfortable. Relaxed cruising: Helming from the protection and comfort of the padded cockpit seats is made possible due to the low heel and stable sailing provided by high volume ama design and a huge unfolded beam. 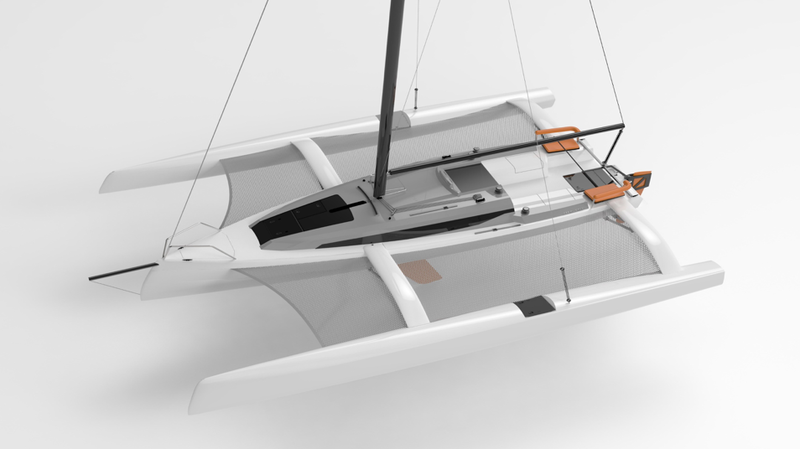 High speed racing: A 44-foot carbon rig, laminate sails offered on the Sport model, combined with the impressive low-rocker hull design deliver class leading performance. If you're interested in knowing more about the Corsair 880 or the Corsair 880 Sport contact Richard Allen. Pricing? contact me, you’ll be pleasantly surprised!